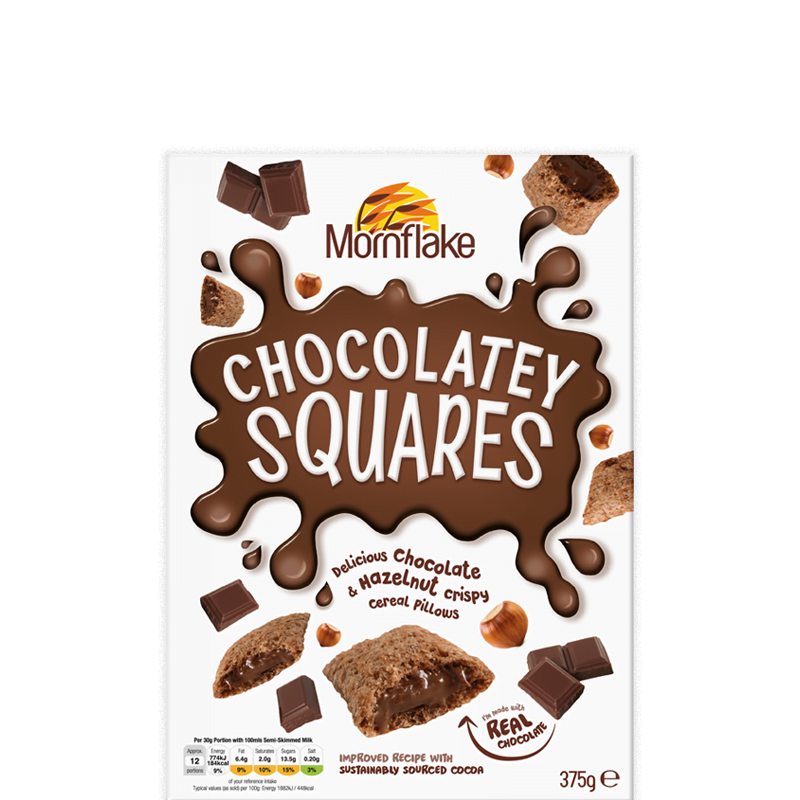 Our Chocolate Squares are temptingly tasty, making them brilliant to nibble on at any time of day. These plump pillows of chocolate and hazelnut are fortified with added vitamins and iron. Chocolate & Hazelnut Filling (32%) (Sugar, Rapeseed Oil, Palm Oil, Fat Reduced Cocoa Powder, Chocolate (1.3%) (Sugar, Cocoa Mass, Fat Reduced Cocoa Powder), HAZELNUTS (1.3%), Emulsifier (Sunflower Lecithin), Natural Flavouring), Riceflour, WHEATFLOUR, Sugar, OATFLOUR, Maize, Fat Reduced Cocoa Powder, Salt, Folic Acid, Iron, Niacin, Pantothenic Acid, Thiamin [Vitamin B1], Vitamin B12, Riboflavin [Vitamin B2], Vitamin B6, Vitamin D, Vitamin E.
For allergens, including cereals containing gluten, see ingredients in BOLD. Also, not suitable for MILK or BARLEY allergy sufferers due to the methods used in the manufacture of this product.